How about visiting a region with wild mountain landscapes, ancient stone towns and miles and miles of beaches, all without the tourist crowds? Tucked between the rolling hills of Tuscany, the green heart of Umbria and the twinkling Adriatic Sea, Le Marche is the place for you. The region is warm, inviting and nearly unknown to international visitors. Overlooked by its neighbors to the west, Le Marche is a region all its own, with a unique landscape, history and cuisine. Slow down and follow winding country roads past wildflower fields, from Renaissance towns to sparkling white beaches. Less crowded and less expensive than most of Italy, here you can enjoy small-town Italy in the true Italian countryside and beaches that still feel untrammeled. Le Marche is slow-travel, authentic Italy at its finest! 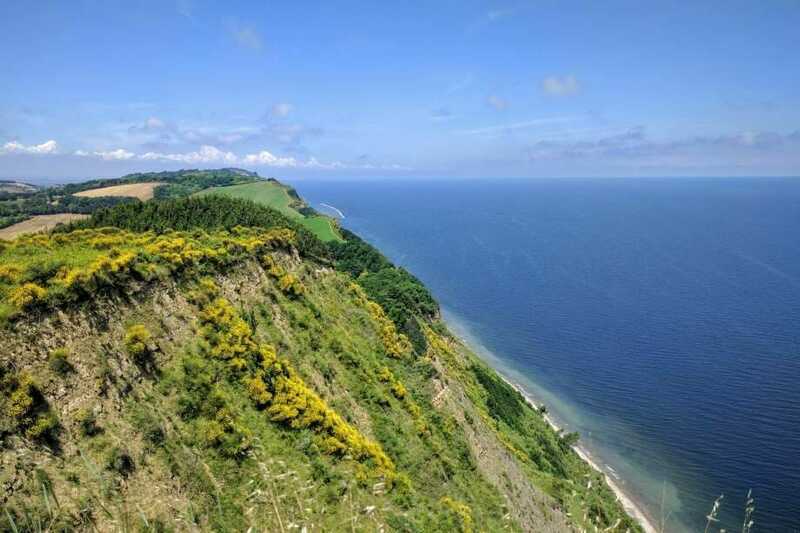 The landscape of Le Marche is split between the tiny Medieval hilltop towns dotted among the Appenines, Italy’s mountain range that runs the country like a spinal cord, and the old seaside resorts found along the region’s more than 100 miles of coastline. Where you go depends on what you prefer. The region’s charm is in its variety! A brick hilltown, Urbino’s the most famed and historic of Le Marche’s towns. It was Raphael’s hometown and a booming destination in the 15th century. Ruled for years by Duke Federico da Montefeltro, its his palace that dominates the town. The town flourished under his rule in the 15th century, becoming a sort of ground zero for artists, scholars and veritable Renaissance-men in that time. Today the city center is a UNESCO World Heritage Site and the Palazzo Ducale houses a Renaissance art museum with work by Piero della Francesca, Uccello and Raphael. 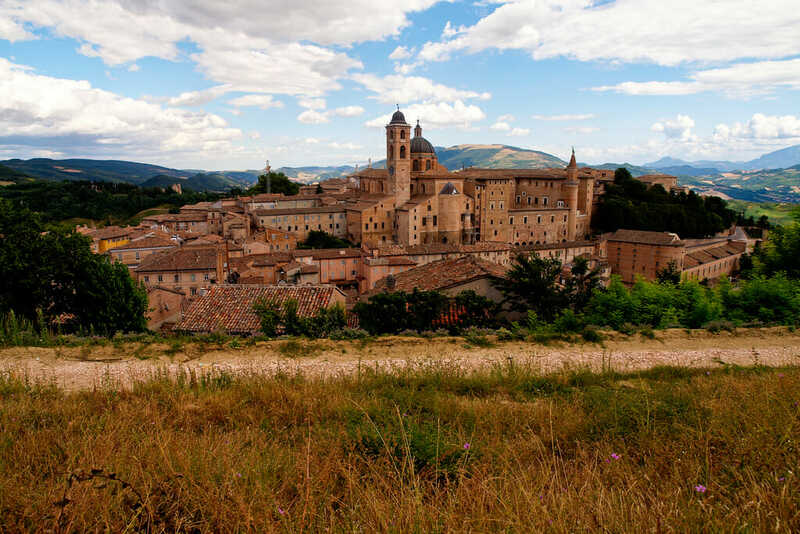 The past would be it for Urbino if it weren’t for the university located there, saving the town from being frozen in time and bringing life to the tiny city center. 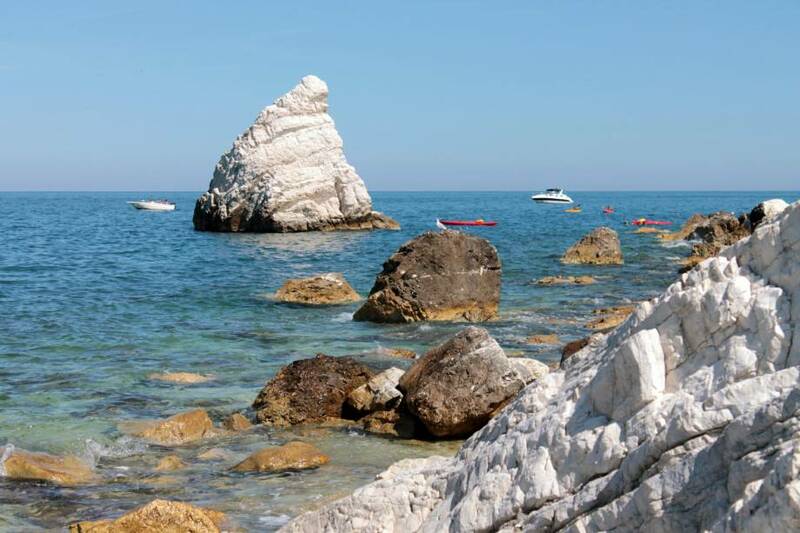 A big-hitter in northern Le Marche, Pesaro is a favorite among families and European travelers for its wide, sandy beaches. The biggest draw is definitely the beach, but the centro storico still deserves some exploration. 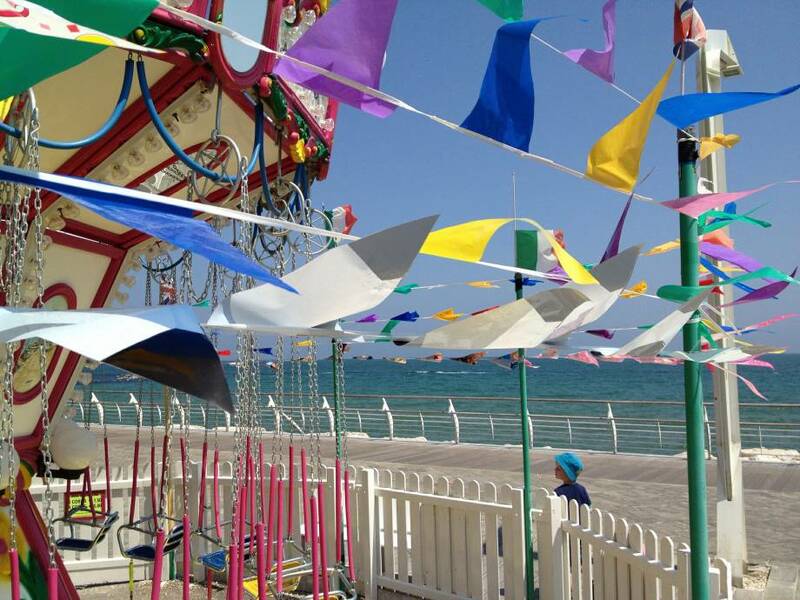 A popular resort town, it’s nevertheless smaller and less chaotic than Rimini, 25 miles up the same stretch of coast. Macerata is a slow-paced university town located in Le Marche’s sparsely populated interior. Built of soft pale brick, much of the town and surrounding area was destroyed in the 2016 earthquake. Though signs of the devastation are still visible, the town’s famed annual opera event is still on. Macerata is home to the Arena Sferisterio, a Roman open-air opera theater that rivals that of Verona. Travelers can enjoy the operas hosted there throughout July and August. Loreto is known throughout as the current home of the Holy House of Loreto, the house of the Virgin Mary. Originally in Nazareth, this is said to be the home where Mary lived, conceived and raised Jesus. How it got to Loreto depends on who you ask — Catholic tradition has it that angels miraculously brought the house to Loreto to save it from invasions, whereas historians cite an aristocratic family with the last name Angelo as the patrons of the house’s move. Today, the house is inside a massive basilica in the small town of Loreto and millions of spiritual pilgrims come to visit it every year. This coastal city knows its share of strife: bombed repeatedly during WWII, the region’s earthquakes have shaken loose what was left. Ancona has the classic feel of a port town, a bit gritty, a bit transient (ferries from Croatia, Albania and Greece come and go) but it’s worth visiting for its history alone. 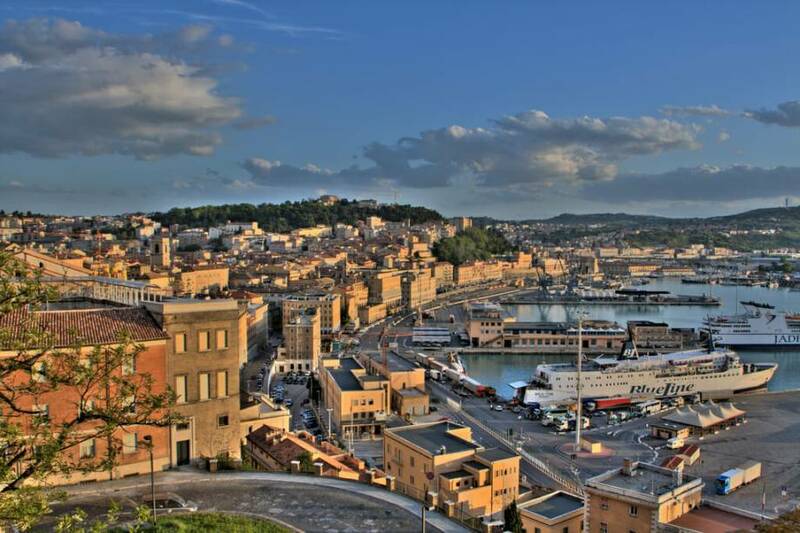 Ancona was founded as a port-city, when the ancient Greeks opened an outpost there from Syracuse, Sicily. You can still see the second-century Trajan’s Arch in the port and it was a major hub during the Crusades in the Middle Ages. Today Ancona is still a convenient transportation hub for the region, though now for cargo and tourists. The Falconara airport is just 10 km from the city, there are also regular ferries and decent train connections to much of Le Marche, but otherwise the city is worth just a quick tour to research the region’s maritime history. Struck by the devastating earthquake in 2016, Le Marche’s second most important city is happily up and running again, and still a hidden treasure of the region. The small center is surrounded by walls but filled with grand architecture and one of the most beautiful piazze in Italy, Piazza del Popolo. Built in the city’s classic white travertine stone, the piazza feels like the living room of kings, and has more or less functioned as one since Roman times. Stop at a charming sidewalk cafè and enjoy the view. Just south of Ancona is perhaps the best coastline of Le Marche. Here you’ll find tiny pebble beaches and dramatic limestone cliffs plunging into the sea, like the namesake Monte Conero. Portonovo, Sirolo and Numana are favored beaches, but all the seaside villages have beach resorts and a laid-back charm. Beyond the beach, explore the walking trails that crisscross the nearly 700 square foot Parco Regionale del Conero. San Marino is actually an independent nation-state located inside of Italy, but it deserves a mention as a unique side trip for travelers in le Marche. At roughly 700 square feet, San Marino is a bit of a political oddity. It is the fifth-smallest country, the world’s oldest surviving sovereign state and its oldest republic. Born out of Italy’s nation-state history, its capital city is also UNESCO World Heritage Site! 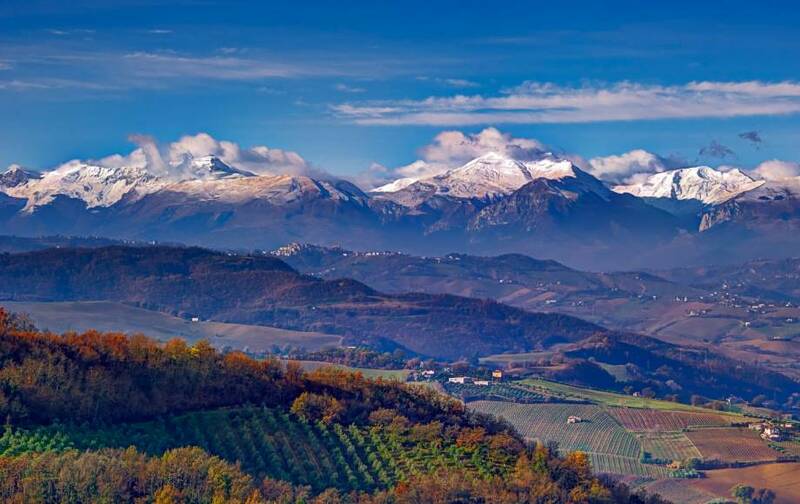 Probably the most beautiful stretch of the central Appenines, the rugged Monti Sibillini Park spreads across roughly 173,000 acres of the Marche-Umbrian Border. Hiking and mountain biking are the two biggest draws to this beautiful and wild national park. There are a ton of paths, but those looking for a real adventure can try the Grande Anello dei Sibillini (The Great Sibylline Ring), a nine-day, 75-mile loop through the park. You can base yourself in one of the villages in the Sibillini foothills to explore the park, but its best to have your own transportation. Le Grotte di Frasassi is the largest karst cave system in Europe. Visitable with a guide only, you’ll tour caves filled with stalactites and stalagmites, as well as the Ancona Abyss, a room so large that Milan’s Duomo (the world’s largest Gothic cathedral) could fit inside. You’ll also visit a crystallized lake, a Grand Canyon, and a room filled with formations that resemble candles. It’s the perfect way to really get in touch with the region’s outdoors, even if you’re technically underground. Le Marche’s food is enriched by its landscape: with mountains, hills and the seaside, its deeply traditional cuisine is rich and varied. The region’s rural background is reflected in the food with simple grilled meats, game such as rabbit and duck and solid fish soups along the coast. 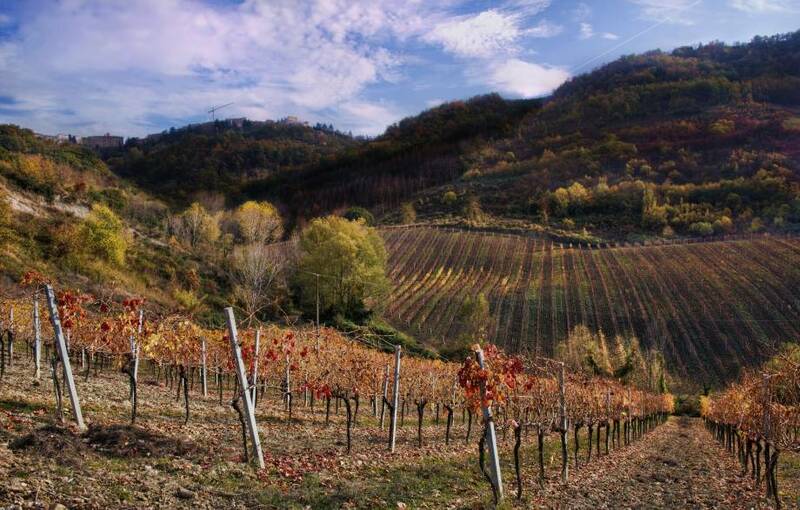 The region produces wines that hold their own against Tuscan vineyards and uses the celebrated black truffle of central Italy in many of its most popular dishes. From Ascoli Piceno, these green olives are pitted, stuffed with a filling of meat and cheese then breaded and fried to perfection. Served as an appetizer or a snack, you can get them from street vendors to eat on the go as well. In a region known for its pork and other grazing meats, you can expect some excellent salumi. 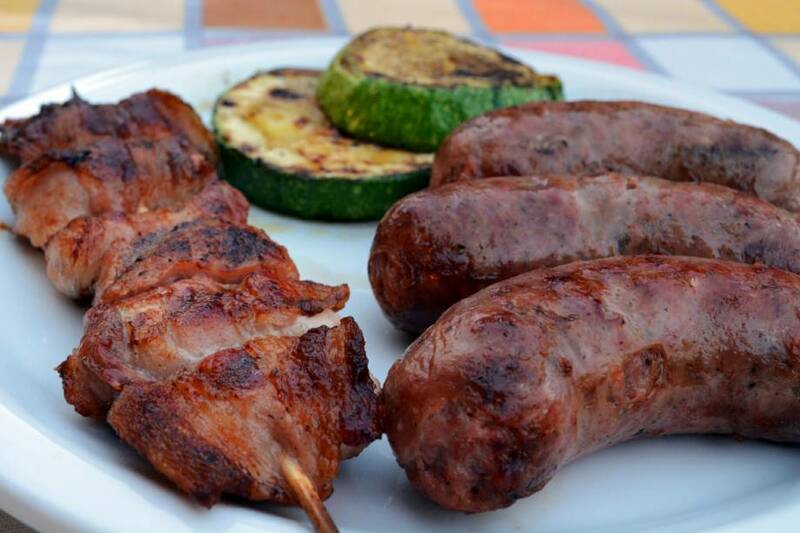 Try the ciauscolo, a pork-based spread, or the delicious and protected prosciutto di Carpegna (DOP). Throughout the region you’ll find fish soup on the menu, but be careful, the recipe various from town to town. Perhaps the most known is Ascoli’s fish soup, flavored with saffron. Others include Pesaro and Ancona’s red fish soup, made with tomatoes. Either way, expect nearly 14 different fish in your brodetto and a ton of flavor. Two of the region’s most famous reds, these are rarely known outside of Italy. The Rosso Piceno from the Ascoli Piceno area is fruity red wine made from a blend of local Sangiovese and Montepulciano grapes. While the Rosso Conaro is a full-bodied red grown along its namesake peninsula made from the same Montepulciano grape as Chianti. A region with seafood as well as game needs a solid white wine as well, and Le Marche has it. Verdicchio gets its name from the green-gold color of this white wine, perfect with fish and the various fritti misti of the region. By far the best way to get around Le Marche is by car, and it’s the only way if you want to visit some of Le Marche’s smallest towns and parks. The A14 highway runs from Bologna to Taranto and follows all of Le Marche’s coastline. 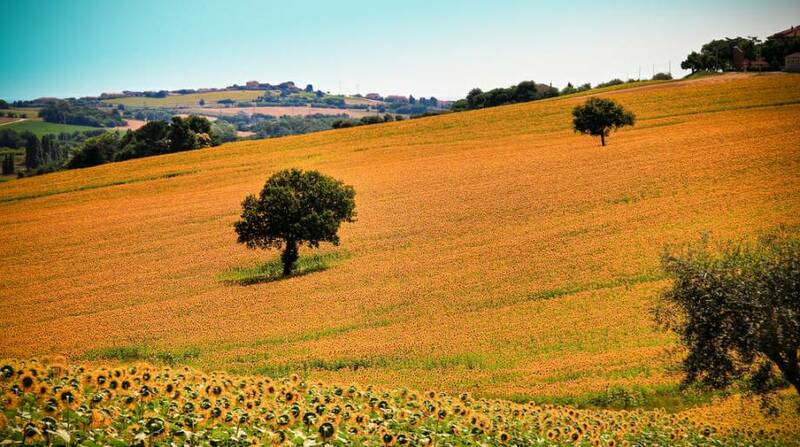 From there take state routes inland to visit Le Marche’s hill towns. For those not up for the drive, there is a railway that runs between Milan and Lecce, Puglia, but it’s only stop in Le Marche is Ancona as well as an airport and port in Ancona.